No one in their right mind makes soup in the summer, unless it’s Vichysoisse or gazpacho or a fresh tomato with saffron and rice (Julia Child & Simone Beck’s Mastering the Art of French Cooking – Volume Two – p. 20, “Potage Magali”). Ha-ha-ha! You thought I was going to say, “except me” but, no, even I don’t make soup in the summer. I will pull it out of the freezer and reheat it. And on this hot summer day, I have pulled out one of the heartiest, Butternut Squash. I only make it once a year, in the fall, in time for Thanksgiving, because it seems so Martha Stewart-y to serve my guests the first festive course in tiny little demitasse cups in front of the fire in my living room. I only give you a miniscule serving and pour the remainder into zippered freezer bags to enjoy throughout the winter. I’m selfish that way. When you make something only once a year and don’t use a recipe, you have to rely on your sense memory to get it just right. But much of cooking is sense memory, isn’t it? How did it smell? How did it taste? How thick was it? Creamy or chunky? Tart or sweet? I can still taste a dessert that I had at the Hôtel Albert Ier in Chamonix in 1989. I’ve never had anything like it since. I was so delirious from the experience that I stole the menu and had to dig it out to get the name. The hotel and restaurant are still there, but the website doesn’t offer current dessert features. Being frozen, it had no scent, so I was completely dazzled that the taste and not the aroma brought up the memories. (Yes, I understand that smell and taste are linked, thank you.) We’ve all smelled Christmas trees and candles and potpourri and soap, but I’ve never put them in my mouth. Googling the phrase “miel de sapin” from the menu, I see that it more accurately means “fir” or “spruce,” and my family always had a blue spruce tree. So, there you are! Although I have never seen it on a menu again, I can still taste it. So, now I’ve been asked to share my recipe for Butternut Squash soup, and I must give you my disclaimer. I remember what I put in it and the process, but I’m not certain of the exact quantities, because I only make it once a year. I know, I know what you’re saying, “I hate those people who say, ‘oh, I just throw in a little of this and a little of that.’” But it’s true. Give it a try, taste as you go along, and adjust it to make it your own. How often do you make something and think, “What’s not-quite-right?” If the Granny Smith apples make it too tart, add a little more brown sugar. If you don’t like spicy, omit the chipotle and/or cool the heat with a little extra cream. Don’t use alcohol? I use it to add depth and richness. Maybe another parsnip. Over low heat, stir in sugar until well-blended, then stir in nutmeg, cloves, allspice, cayenne, and chipotle (to taste). Stir in rum, sherry, and Armagnac. Simmer 10 minutes. Stir in heavy cream and heat without boiling. Adjust sugar, alcohol, spice, and salt to taste. Ladle into individual containers and garnish, if desired. And if you’re into wine, I always serve it with a Gewürztraminer. When cool, ladle into freezer bags or containers. Reheat and then garnish. Categories: Humor, Recipes, Travel | Permalink. I’ve been on the fritz. I tried whacking myself upside the head. I’ve shaken myself. Jiggled the handle. Twisted the antenna. Rebooted. Let it rest. Poked it. But today, as I lay in bed with the perpetual mist and gloom that winter and spring became this year, I was jump-started, as good as if someone stood over me with de-fib paddles. It’s my birthday. I’m 64, today, and this isn’t what I was expecting. In my fondest childhood dreams, I was sure that I’d be an actor or a writer. Not quite, although I am, in my heart, a darn fine actor, if someone needs a 64-year old actress, which no one does. I could still be a writer, if I were more disciplined. Ahhh. Discipline. Something I never quite learned. In my defense, I’ve been writing these past four months, but I haven’t finished anything. 20 beginnings and no endings. As usual, I have plenty to say (Karma, bad weather, grief, politics, my neck), it alternated between angry and maudlin. 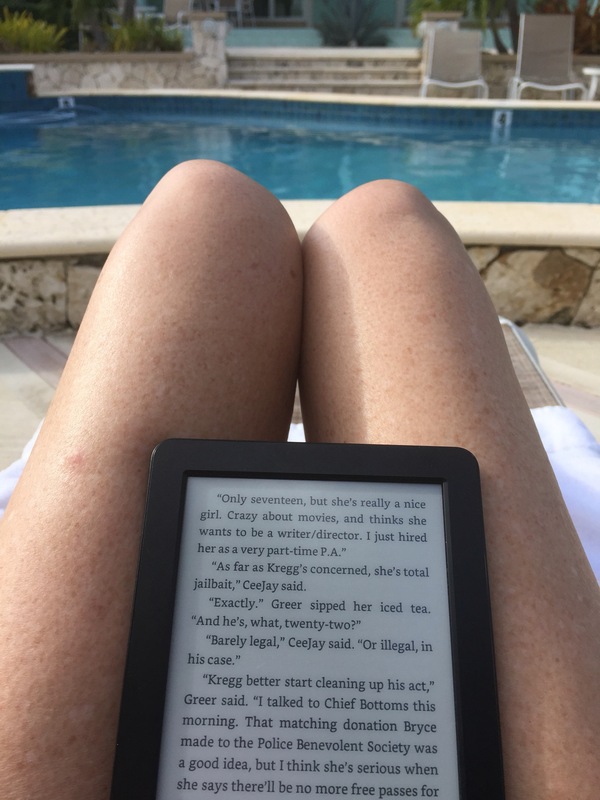 Blog-writing is self-indulgent (no editorial oversight), and we should all be grateful that I self-censored the drama that plays out in my head. When I awoke this morning, I allowed myself 10 minutes of maudlin thinking. I started that when The Veterinarian went over the Rainbow Bridge. I allowed myself 20 minutes to grieve (only in the morning) and then forced myself to get up and get moving. Fortunately, My BFF jumped on the bed demanding to go out and to be fed, as she does every morning, which has saved me, really, these many months. You can’t be too self-indulgent, when you’re responsible for others. June 4, 1962, at 10 years old, always a flower from a different field. And then it also hit me. I’m not dead yet. This is the rest of my life. I’m not going to just sit and look out the window all day. My life isn’t over. For better or worse, I see many more years ahead. My Mother will be 89 in October. Her sister was just 90 in January. One of her cousins is 93. Like me, they’re all short women, all “ornery,” as a man I know describes me. All with the same high blood pressure and cholesterol that I have. I see my future, 30 more years, probably. So, how shall I spend it? In the arts, of course. I started studying a new version of an old dream. I’ve plunged into ballroom dance with my bad knees and attitude, bringing my smart mouth and lots of ballet and modern dance technique and skills that frequently hinder me. Of course, years of being immune to making a fool of myself onstage comes in handy. After all, I once played a salmon swimming upstream to spawn in “The Life Cycle of a Salmon.” Wearing an elegant gown covered in Swarovski crystals has that beat by an ocean of elegance. Inspired by a friend who found satisfaction in ballroom dance during a tumultuous struggle of her own, I found some lovely people who, later in life, discovered the world of glitz and glamor in which I’ve been living since I first danced in a petticoat and My Mother’s costume jewelry for My Dad’s movie camera, 60 years ago. When I’m dancing, I’m a vision of grace in the movie that plays in my head. Well, I’m content until I hear, “Close your thighs, Suzanne.” “Girls up, Suzanne.” “Don’t turn out, Suzanne.” When I hear that, I’m transported to a ballet studio in a drafty hall and hear, “Straighten your knees, Suzanne.” “Elbows up, Suzanne.” “Turn out, Suzanne.” Nothing is ever going to be perfect. And that’s ok.
I’m back in a place where I’m happy not being perfect. Well, kind of. I still have high expectations of myself, but it’s a place that feels comfortable and familiar; a place where “Standards” are kept (no swearing, no jeans) and irony revered; a place where the lights are low on Saturday practice evenings, so we all look our best. It’s a place where I’ve been described as “A Flower from a Different Field,” a description so lovely and so apt that I’ve taken it on as my personal motto, although My Mother reminds me that it could mean a weed. Oh, well. Someone’s weed is someone else’s flower. Plus, I’ve found something new to write about! Well, no dates. I turned off the matchdot com account in February after I received an email from a man whose screen name was Brett of Fresh Aire and whose profile photo showed a man frowning. After studying the photo and profile for a few minutes, I realized he wasn’t being ironic, intentionally. That’s when I realized that I wasn’t going to find a flower in the field of online dating. I met a nice couple in dance class who met online, but “nice” is the key word. I’m “A Flower from a Different Field.” And that’s ok. Independent. Bossy. Cranky. Ornery. Whatever. I meet lots of men at dance class, all of whom are happily married or outside of my age group. That’s not why I dance. I also got an email from a guy at a “consumer protection” website a few weeks ago and another follow-up last week. He claimed to have read my dating posts and wanted to know if I wanted to do something with a consumer protection column about online dating. I say “something” because it’s not clear to me what he wanted. It didn’t seem that they were going to pay me to either submit my posts or link to my blog, so I wasn’t interested. I pointed out that my experience is entirely negative, which does not make for a helpful, unbiased review. Now, if they want to cough up some money, which would help pay for my ungodly expensive new hobby, I would reconsider. June 4, 1982, 30 years: We shared a birthday, separated by 17 hours. Today, I’m 64. To borrow from Paul McCartney (also a Gemini), I could use a handy someone to “mend a fuse when [my] lights have gone” or [do] the garden, [dig] for weeds, but where I’m moving, there aren’t any fuses and someone else will tend the lawn and remove the snow. Still, a handy someone showing up with “birthday greetings” and a bottle of Champagne would be welcome at my door. But don’t come tonight or ever, without an invitation. Tonight, I’m happy to enjoy a Margarita at my favorite Mexican restaurant with my family and, later, a little dancing with friends in that different field, so, who am I to complain? Life is still good (mostly). Soli Deo Gloria! Categories: Ballroom dance, Dating, Humor, The Arts | Permalink. Categories: Dating, Humor, Now & Then | Permalink. Blog writers take a lot of flak for writing self-indulgent nonsense, sort of like people who post photos of everything they eat on Facebook. I uniquely am guilty of both. On a day when I am still somewhat homeless (I made it home from Grand Cayman but cannot get to my house for the 33” of snow that clogs my lane — you and I aren’t done yet, Karma), I offer photos of food that crossed my path on vacation and a lame little explanation to go with them. I have waxed poetic about my weird food fetishes. For example, I don’t eat fruit, except Smucker’s grape jam (not jelly), Key Lime pie, and the occasional raspberry coulis, provided it has been seeded, strained through a fine sieve, and adequately sweetened. And wine. I drink wine, fruit of the vine and all that. One of my big taboos, which I know others share, is food touching other food on my plate. I should clarify. Food that is supposed to touch other food is acceptable; eg, gravy on mashed potatoes, Béarnaise on steak, the aforementioned raspberry coulis under (not over) a fine dark chocolate dessert, aged Balsamic drizzled on pan-roasted salmon (I’m really craving at the moment). But I get nervous when cole slaw runs onto my fries or guacamole slips onto my refried beans or a Kosher pickle spear touches the rye bread on my corned beef brisket sandwich. I am the kid at the party who won’t eat the birthday cake, if the ice cream touches it. Someone once told me to push my last pea into my mashed potatoes so I could pick it up. Sure. I could pick it up that way, but I would never put it in my mouth, much less swallow it. Buffets are a nightmare. I don’t take anything “runny” that might infect another, unrelated item on my plate, so I’m one of those guests that the waitstaff hates because I use too many plates. I want my bread in its own space, so it doesn’t get mushy on one edge and so the butter doesn’t come into contact with a potential pollutant. Traveling is always a culinary adventure, unless I’m going to France, where I’ve never seen a French chef put something on a plate that didn’t make sense (except the rognons de veau, veal kidneys). The Veterinarian would eat anything (except rognons de veau), so he was the perfect dining companion (except the day I accidentally ordered rognons de veau). If I couldn’t eat something, he almost always could. The Daughter is a little pickier, but her culinary adventurous beau was a welcome dining companion. Here’s a visual chronicle of dining in the quiet East End of Grand Cayman, including a buffet hazard at one of our favorite Caymanian restaurants. Nothing revives me after an arduous day of traveling like an adult beverage. With a healthy dose of Cuban rum, I don’t even care that my hair is frizzy and about to stand on end in the warm breeze. On our first night, we only had the strength to sit on the deck at the resort’s Eagle Ray’s bar and grill and order ribs and lionfish tacos. Lionfish are that beautiful, multi-spined fish native to the Pacific that has invaded the Atlantic and Caribbean, from Maine to South America, where it has no predator. Not even sharks will eat them, so they are reproducing and gobbling up native fish with abandon. Geared to scuba diving and sensitive to the health of our oceans, Ocean Frontiers, our resort, and many others in the Caribbean, now cull them by spearing and selling them to restaurants. Once they are dead and their spines are removed, they are benign, their meat pale white, very mild, and not especially firm. It is popular in ceviches and tacos. The Daughter opted to treat us to Sunday brunch at Tukka, a “native fusion” restaurant, whose owner and head chef, Aussie Ron Hargrave, brings together kangaroo and crocodile meat and local seafood with Caribbean influences. Right over the beach, it’s been a favorite of ours since it opened and boasts a lavishly painted chair in honor of celebrity guest Taylor Swift. You can see the dilemma on my appetizer plate. At “one o’clock,” the lion fish “lollipop” (lightly battered with a nice little garnish to give it flavor) hugs the rim, well away from the Caesar salad below it (I shudder to have salad on the same plate with the appetizers), which nudges two potstickers filled with ground pork and bathed with a soy-and-sesame sauce, avoiding the potato salad above. Sitting primly at “noon” is a tuna roll, with accompanying wasabi, pickled ginger, and a dollop of wakame (seaweed salad). Of course, since there was enough Champagne to wash it all down, I didn’t notice that my excellent ribs nudged the roast beef and the delicate Mahi Mahi. As for the rice, it doesn’t matter what it touches. Rice is rice. Oh! And I just had to have another potsticker, this one with a chili sauce. I never have trouble picking a dessert. I chose these two little dishes because I liked the blue color of the glass and porcelain. On the left is a white pudding dotted with yellow corn kernels, that was lightly sweetened and topped with chopped nuts. On the right is a traditional cake made from cassava, a root which, when ground, is the source of tapioca. Here, it is grated and mixed with coconut milk, brown sugar, butter, and spices into a dense cake topped with grated coconut. Yummmmeeeee! For breakfast, we trekked to a funky little place, the Over the Edge Café, whose deck is, indeed, over the edge of a reef at Old Man Bay, just before the ocean plunges thousands of feet. Not a big breakfast eater, I always have the French toast. The Daughter opted for a scrambled egg, cheese, and salsa-filled quesadilla. But the adventurous eater amongst us won the prize when he ordered a “traditional Jamaican breakfast of Codfish and Ackee.” Bless his heart! It turned out to be a plate of eggs scrambled with codfish, bell peppers, onions, and ackee, a tree fruit from West Africa that was imported from Jamaica to England by Captain William Blighe, that same ill-fated commander of HMS Bounty. We found the ackee tasteless and a little chewy. Accompanying it were some cooked greens and a lot of starch, plantains, a little sausage-shaped banana pudding, and some delightful fried dough, reminiscent of beignets, especially when I dragged mine through the mound of powdered sugar from my French toast. One of my favorite pizzas is topped with arugula, and the Italian Kitchen, which brought brick-oven pizza (and more fine wine) to the East End, adds prosciutto. They also serve upscale Italian food and fresh seafood, including a fabulous risotto with lobster and shrimp that was just beyond this year’s vacation budget (once we had to spend four extra nights on the island, thanks to the blizzard of 2016). Yes, I cooked. I made The Daughter’s favorite lasagna. I made a Key Lime pie. I made Chicken Tarragon salad on croissants. I made caramelized onions to top the cheddar cheeseburgers that the “kids” grilled. And on our last night, I turned the broth from cooking the chicken for the salad into chicken noodle soup. I used the last of the onion, celery, and carrots to flavor it and cracked up unused, uncooked lasagna noodles into the broth. It was fabulous, but, on vacation, everything tastes better, and nothing has any calories, right? All in all, it was a good vacation; four extra days of sunshine and good eating, so, who am I to complain? Life is good (mostly). Soli Deo Gloria! Categories: Food, Humor, Travel | Permalink. Happy Pi or Pie Day! 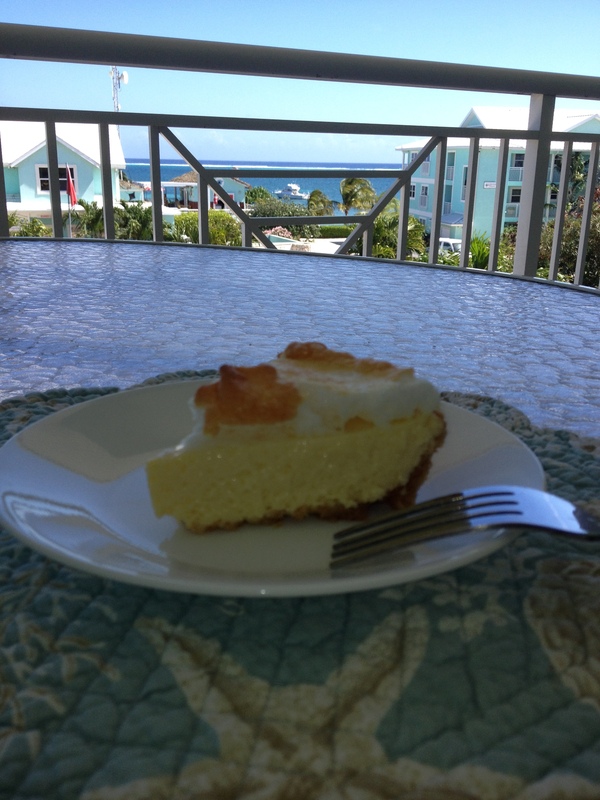 Note: When I was in Grand Cayman last March, I made this pie on Pi Day. Stranded this weekend (no hate mail, please) in my favorite place on Pie Day, without a functioning laptop, I’m republishing that same post. Sorry to be redundant, but typing on this iPhone is a real pain. By the way, I made Key Lime Pie earlier this week in Paradise for The Daughter and her beau but didn’t think to photograph it. You’ll just have to take my word for it; it was delicious. Hope it brings a breath of the tropics to your snowy day! I am nearly useless at two things, pie crust and math, but even I know what pi means. It’s how I learned to make circle dance skirts. In honor of Pi Day (3.14.15) and National Pie Day (1.23.16), I am sharing my recipe for the only credible pie that I can make. Oh, I make a great pumpkin pie (with freshly ground black pepper) using pre-made crust. I make a great apple tart using Pepperidge Farm Puff Pastry (aka Grease City) or phyllo dough. I actually receive requests for my Key Lime Pie. I have seen grown men swoon over it, so I added it to my list of accomplishments in my online dating profiles. I can make it in my sleep. When I first had it, back in the 70s in the Florida Keys, I was told that the recipe was on the Borden’s Sweetened Condensed Milk can. I also learned that if it was green, it was bogus. Of course, I couldn’t leave it alone and improved on it. I added almonds to the crust and whipped egg whites to the filling to lighten the custard. About five years ago, in Key Largo, for dessert, I had an amazing “Key Lime Cocktail” with graham cracker crumbs around the rim. I’m still trying to perfect that recipe and will let you know when I’m successful. Practice, after all, makes perfect. Press crust on the bottom and up the sides of the pan. Refrigerate for a minimum of 30 minutes. In a glass, grease-free bowl, whip egg whites and ¼ tsp of cream of tartar until foamy. Add sugar and whip until stiff peaks form. Set aside. In a separate bowl, beat eggs until lemon-yellow. Stir in lime peel and condensed milk until blended. Thoroughly mix in lime juice until blended. Fold ½ cup of the beaten egg whites into the custard mixture and pour into chilled crust. Bake at 350° for 20 minutes or until filling just starts to brown around edges. Remove pie from oven and increase heat to 500°. Pile remaining meringue over filling completely, and bake until peaks are golden brown, about 5 minutes. Note: If you won’t be serving the pie for several hours and do not want to see the meringue “weep”, you can refrigerate the “un-meringued” pie, covered, until needed. Just before serving, cover with meringue and brown in hot oven. Categories: Food, Recipes | Tags: Cooking, Key Lime pie | Permalink. These are all “First World Problems,” and I need to shut up about it. I am well aware that, despite my life’s challenges, disappointments, grief, lawsuits, and heartbreak, I lead a charmed life. Just this morning, a friend back home told me the temp was only 8, with a windchill of -5. Yes, yes, friends in Michigan, I know that sounds balmy to you. I have no idea what it is here, where I sit by the pool in my bikini. Or maybe it’s just the Havana Club rum talking (which is how I get the nerve to sit in public in a bikini…that and the fact that there are no people around). So far, I’m enjoying myself. I haven’t had to pay for anything except the aforementioned rum (children can be such a blessing), but, to earn my keep in my own vacation retreat, (where I get the master suite), I also made lasagne for dinner, and my Key Lime Pie for dessert, while they are hiking. Blech! You couldn’t get me to hike without a cattle prod (which is why no men want to date me — so take heart— apparently, looking passable in a bikini at my age is not as important to divorced/widowed geezers as hiking and kayaking. Sudden thought: what does a bikini imply that they may not be up for, if you get my drift? I’ll have to think about that. And NO! I only post tasteful photos of myself. Karma is not done with me, yet. It seems there will be a significant snowstorm on Friday, when I’m scheduled to fly to Philadelphia via Charlotte, and on to NYC on Saturday. Let’s spin Karma’s wheel (mixed metaphor?) and see where I spend Friday night…Charlotte? Philly? Or will Karma take pity on me and let me stay in Grand Cayman for one more night? On the other hand, to cheer you up, it was supposed to rain here today, but the sun is shining, so, who am I to complain? Life is good (mostly). Soli Deo gloria!